Prime Minister Narendra Modi on Monday summarily dismissed any talk of repealing the controversial Armed Forces Special Powers Act (AFSPA) in Kashmir, likening the removal of AFSPA from the Valley to "sending our soldiers to the gallows." The prime minister said this in an exclusive interview to Rahul Joshi, group editor-in-chief of Network18, hours after releasing the Bharatiya Janata Party's election manifesto which put nationalism and national security at the front and centre of its next term, if re-elected. The interview will be aired at 7 pm tonight on CNNNews18 and all the other 19 news channels of the network. Firstpost will also stream the interview live. Repealing of AFSPA in Kashmir, a long-standing demand of human rights groups, was brought back into national discourse on 3 April when the Congress party promised to kill the Act if it is voted to power. Apart from giving powers to the Army to enforce law and order in disturbed areas, AFSPA protects the Army from litigation in human rights violation cases. The Congress wants to remove this legal cover with respect to "enforced disappearance, sexual violence or torture". But Modi, in the middle of a high-voltage election campaign on the theme of nationalism and patriotism — in full bloom after the Balakot air strike deep inside Pakistan — will have none of it. “We are on the verge of eliminating terrorism. Terrorists are demoralised, we are winning a psychological war against them. Instead (of backing such efforts), the Congress manifesto is soft on terror. Their views on the Army are similar to those of Pakistan. No patriot will tolerate this language. Their manifesto talks about removing AFSPA. This amounts to removing weapons from a soldier's hands. Is this right?” he asked. Asked if his government would then work towards a time-bound withdrawal of AFSPA in Kashmir, Modi it was best that conditions did not exist for imposition of AFSPA in the first place. “First, we must create an environment where AFSPA is unnecessary, like we did in Arunachal Pradesh. We removed it from a few districts. We then removed it from some states. We were the first to take such a step since 1980. But we have maintained law and order. The government must have the power to protect its armed forces. Only then will they have the morale to fight. Removing AFSPA from Jammu and Kashmir is the same as sending our soldiers to the gallows. I will never let this happen to our soldiers," he said. 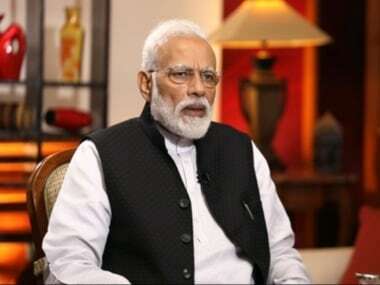 The Prime Minister addressed several other issues such as the impact of the mahagathbandhan in Uttar Pradesh, Rahul Gandhi’s Rafale campaign, relations between India and China, economic growth, demonetisation and why he thinks if Sardar Patel had been prime minister instead of Jawaharlal Nehru, India would have achieved lot more success a lot faster. Catch the full interview at 7 pm on all News18 channels. It will also stream live right here on Firstpost at the same time.